As shown in Table 12, the Principles-of-Learning Framework distinguishes between four agent roles: (a) learner, (b) peer, (c) mentor, and (d) administrator. The learner is assumed to be an active agent, able to determine his or her own learning targets, practice models, contexts of practice, and reasons for engagement. A learner is also able to choose whether or not to engage with learning opportunities that are determined by others, and to decide what level of effort to give. The roles of peer, mentor and administrator are defined with regard to their impact on the learner. The terms mentor and peer are used here in a broad sense, defined by their function in this relationship, as opposed to any concomitant connotation of occupational or enrollment status in a formal institution of education. When a person is co-experiencing learning with the learner and working toward the same or very similar learning goals, they are acting in the role of peer. Peers can be a major determinant of learner engagement by providing motivation, in the form of pleasant affiliation and positive validation, or inhibition, in the form of unpleasant affiliation and negative validation. Peers may also provide examples of emerging or successful models of target performance, and function as observational models to facilitate vicarious learning. Interactive models of practice might also involve peer participation. In some cases, peers will function as human participants in the learning context, without any direct interaction with the learner. When a person determines learning targets, models of practice, motivators of engagement, and context of practice with regard to the current capacity and individual nature of the learner; and when they provide proximal feedback, assistance, and guidance directly to the learner; they are acting in the role of mentor. In contrast, a person that determines learning targets, models of practice, motivators of engagement, and context of practice without regard to the current capacity and individual nature of the learner; and provides only distal feedback (e.g., grades, certificates of completion or graduation); is acting in the role of administrator. Though agents in both roles set the parameters of the overall learning experience, mentors do so with attendance to the specific needs of the individual learner, while administrators do not. 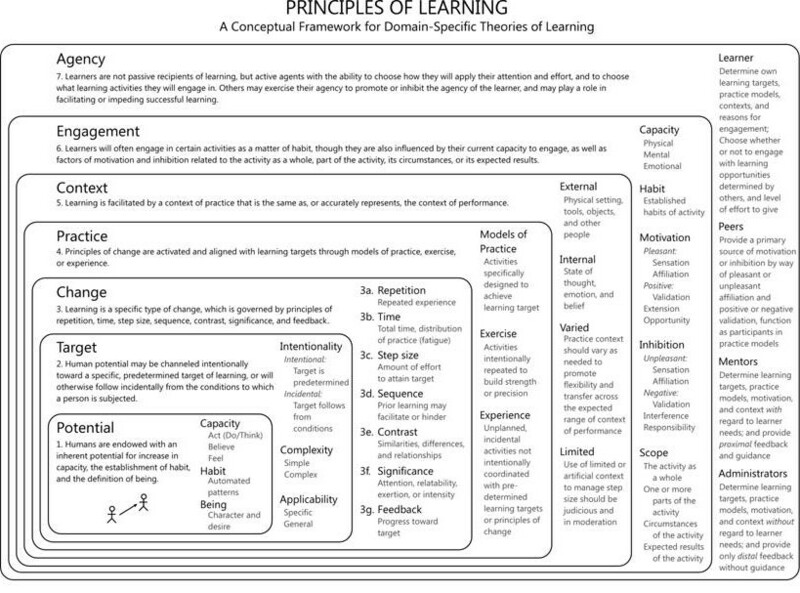 The completed principles-of-learning framework is shown in Figure 9. As shown in Figure 8, engagement is divided into four components: (a) capacity, (b) habit, (c) motivation, and (d) inhibition. The necessary condition for engagement in any learning activity is that the learner must possess sufficient physical, mental or emotional capacity to do so. Where capacity is insufficient it may, in most cases, be acquired through (a) antecedent learning (e.g., the acquisition of pre-requisite knowledge and skills), (b) biological maturation (e.g., growing taller and stronger, or developing coordination), (c) recovery (e.g., from fatigue or injury), or (d) supplementation (e.g., prosthetics, ergonomic affordances, reference material, guides, drugs, or assistance from others). In other cases, the learning activity itself may need to be adapted in order to accommodate learners with limitations that may not be overcome through one of the four ways listed above. There are many and various reasons for which a person might engage in, or avoid, a given learning activity. It is usually the case that a person will engage in certain activities, do things in a certain way, or avoid certain activities, based on previously established habits. 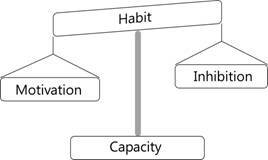 Habits of activity, however, are subject to current levels of capacity, factors of motivation, and factors of inhibition. Given sufficient capacity, habits of engagement are swayed by factors of motivation or inhibition. An enumeration of these factors is given below. Each factor of motivation and inhibition may be associated with (a) the learning activity as a whole, (b) one or more parts of the learning activity, (c) the circumstances in which the learning activity takes place, or (d) the expected results of the learning activity. While pleasant sensation and pleasant affiliation are motivational factors of the activity itself, positive validation, extension, and opportunity, are associated primarily with the results of the learning engagement. If pleasant sensation and affiliation are not authentic or inherent to the learning activity, they may compete with or detract from it. Hence, motivation in these two categories that is artificial to the learning activity should probably be avoided. At a minimum, it must be conducive to true engagement, or actual learning may be derailed. Like their motivational counterparts, unpleasant sensation and unpleasant affiliation are associated with the activity itself, as is interference. Negative validation and responsibility are associated with its results. Unlike their counterparts in motivation, however, unpleasant sensation and unpleasant affiliation discourage engagement regardless of whether they are inherent to the activity or artificially added in the practice model. Presumably, motivation stemming from the complete learning activity itself will produce the most significant (Principle #3f) engagement, followed by motivation stemming from only a portion or part of the activity, followed by motivation stemming from the expected results of the activity, and then by motivation from circumstances in which the activity takes place. In the third case, circumstantial motivation, the actual source of motivation is incidental to, but not part of, the activity—occuring immediately before or after the activity, occurring in parallel with but separate from the activity, or appearing briefly on the scene in tangential fashion. Proximal effects of inhibition are presumed to mirror those of motivation. That is, inhibition stemming from the activity as a whole will produce the greatest aversion to participation, followed by inhibition stemming from only part of the activity, followed by inhibition stemming from the expected results of the activity, and finally, followed by circumstantial inhibition. This presumed ordering of effect for both motivation and inhibition is assumed to be generally true, but by no means absolute. In many cases, some parts of an activity may be the cause of inhibition while other parts simultaneously give cause for motivation to engage. Although the ultimate determination for engagement is learner choice, as will be discussed next (Principle #7), it is assumed in the model that choice is strongly influenced by the net strength of combined factors of capacity, habit, motivation and inhibition. When capacity is truly lacking, engagement cannot occur. When habit of engagement or aversion has been previously established, that same pattern will generally persist unless influenced by factors of motivation or inhibition. When total motivation outweighs total inhibition, learners will engage. When total inhibition outweighs total motivation, the learner will either abstain from engaging entirely, or will engage and participate in an amotivational state, simply going through the motions(2) but without significance. 2. See Deci and Ryan (2000, p. 72). Just as models of practice are most effective when they are the same as, or genuinely approximate, the activities of performance which they are intended to improve, so too, a context of practice which accurately represents the context of performance is more effective than one that does not. Any limited or artificial context of practice used to manage the step size of learning should (a) be constructed with great attention to specific details of what is omitted, included, or modified relative to the authentic context; (b) should be utilized judiciously with specific purpose; and (c) should not replace the complete, expected context of performance for longer than is necessary. There are two reasons for moderate use of limited or artificial context. The first is that artificial contexts typically do not supply all of the necessary features of authentic activity. The second is that learners come to rely on features in the artificial context that will not be available to them in the authentic context of the activity. Figure 7. Learning is facilitated by a context of practice that is the same as, or accurately represents, the context of performance. Not all features of context are important. Hence, in many cases, part of what is practiced in learning is constant discrimination between salient and non-salient contextual features, and learning to respond to changes in a dynamic context. Because of this, the context of practice may need to vary, both to give learners a chance to identify and respond to critical elements, and to facilitate transfer of skills across all relevant variations which are expected. A useful distinction is made in the framework between internal context and external context. Internal context is defined by one’s state of thought, emotion, and belief. External context is defined by the presence of other people, the physical setting, and any tools or objects present. (1) Context for acts of thinking, believing, and feeling may stem from external sources, but may also manifest as the result of internal factors. For example, specific thoughts might induce certain feelings, and specific feelings might give rise to certain thoughts or beliefs. Context for acts of doing is largely external. Internal context is primarily induced through elements in the external context and sensory input received through interaction, however, internal context which is induced internally is also a factor in acts of doing, and accounts for phenomena such as chickening out or psyching oneself up to meet a formidable challenge. 1. Although tools are a type of object, a distinction is highlighted here between objects which might be used in some way to perform an activity and objects which serve only an interpretive purpose in the activity—for example, a street skateboarder will ride the skateboard object, and slide down a stair rail. In this activity, these two objects constitute tools of use. Other objects in the scene along with their physical attributes—such as a trash can, rocks on the ground, a nearby picnic table, the sheen of the paint on the rail and whether or not the paint is chipped—are objects that provide an interpretive context for the skateboarder to estimate the height of the drop, the slipperiness of the rail, and the best launch and landing point. The term objects is used here to include both animate and inanimate objects. 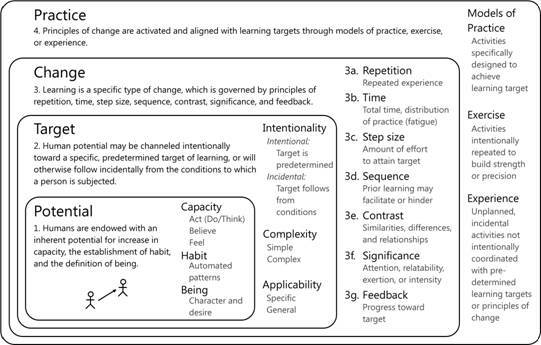 It is in the componential features of practice activities that principles of change are realized and are aligned with learning targets (Figure 6). Just as learning targets may be determined intentionally or incidentally, so too are various types of practice activities determined, with or without intention. As used here, practice models refer to activities that are specifically designed or selected to move a person toward a predetermined target of learning. Similarly, exercise is used to refer to the type of repeated activity that is intended to build up strength or precision—which are two examples of vertical capacity increase that enable a more advanced level of performance. Experience refers to unplanned, incidental activities that are not coordinated with specific learning targets and that lack intentional accounting for implementation of the principles of change which govern learning. Learning occurs in such activities as the result of any adjustment made by a person to adapt to aspects of the experience which are beyond their current limits of capacity; or to modify their patterns of acting, believing, or feeling, thereby establishing new habits. Because it is not directed toward a specific target of learning, incidental learning through unplanned experience is not as efficient as learning through designed or selected models of practice and exercise in the attainment of specific targets. In fact, many learning targets would never be attained without such direction. Note, however, that designed practice models should not be misinterpreted to mean artificial, or decontextualized models of practice activity. On the contrary, the most effective models of practice are those in which practice activities are exactly the same as, or provide genuine approximation of, the activities of performance which they are intended to make possible or improve. 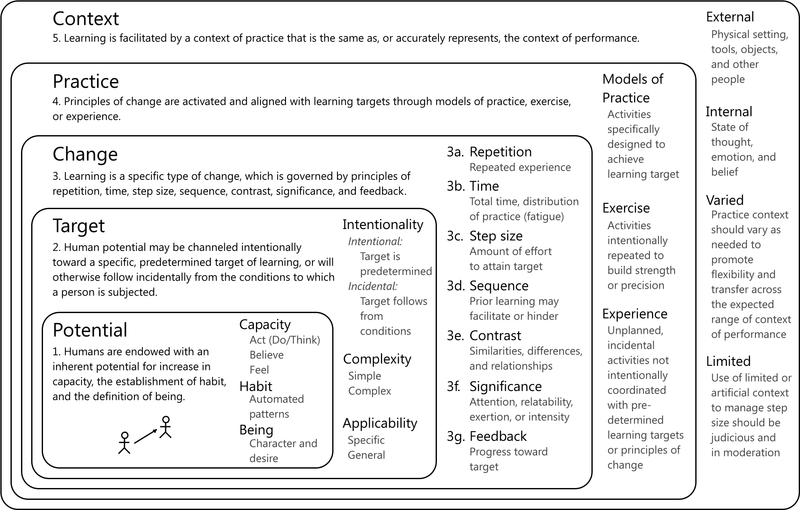 It is certainly possible to design a practice model which simultaneously maximizes learning and approximation of expected activities of performance, though doing so may require some effort. 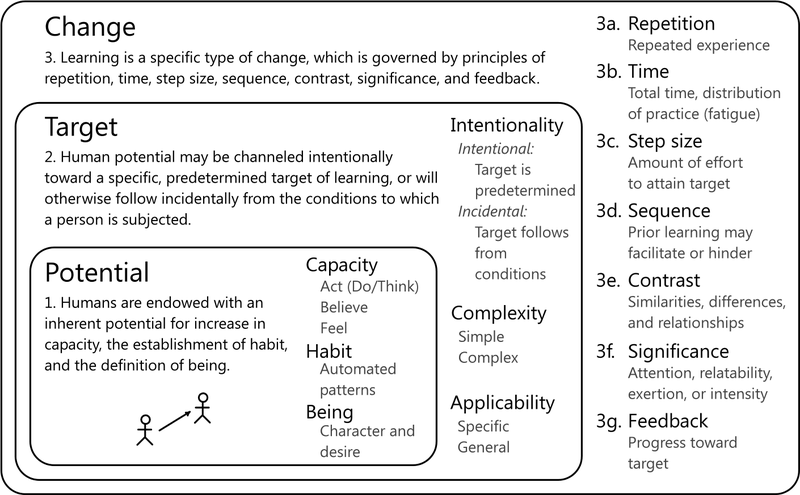 This second principle, which has been added to the framework as shown in Figure 3, deals with determination of the target toward which learning activity will tend. 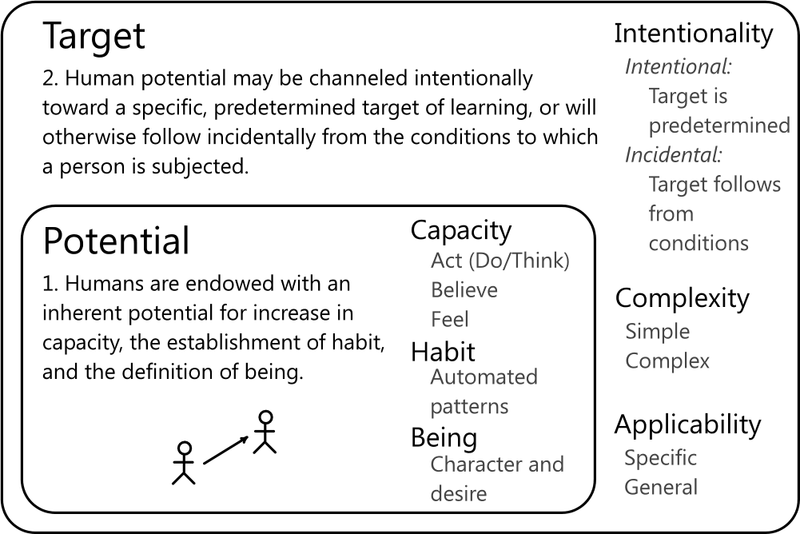 It states that human potential will be either (a) channeled, intentionally, toward a specific target of learning (which channeling may be executed by the person himself, or by another—see Principle of Learning #7 – Agency), or (b) shaped incidentally by circumstance. An intentional learning target is one that is selected and defined in advance of engaging in activity that will lead to the desired learning outcome. An incidental target, on the other hand, is not selected in advance, but is a culminating, consequent result of whatever activities a person engages in. A target may also be considered in terms of its complexity and applicability. The complexity of a target is defined by the number of sub-targets into which it may be divided, recursively. A target of minimal complexity (i.e., a simple target) cannot reasonably be subdivided. 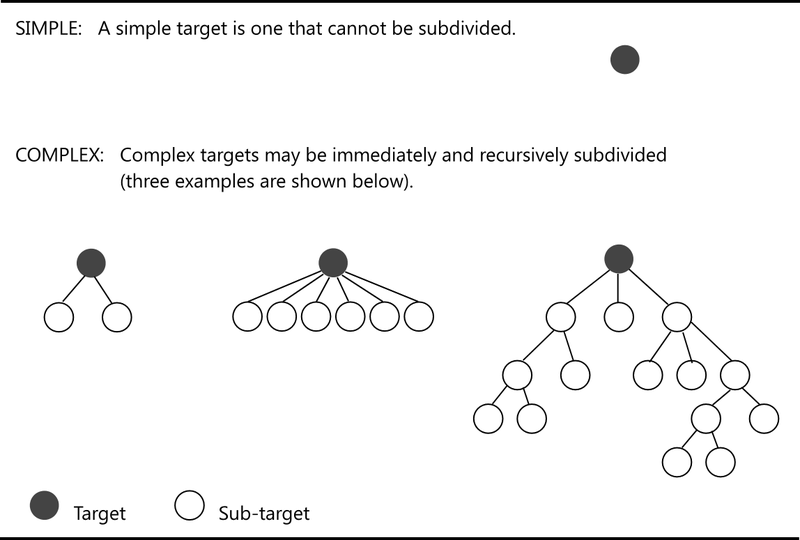 All other targets are divisible into two or more immediate sub-targets, each of which, if also complex, is further divisible, recursively (Figure 4). The applicability of a target is a measure of the number of complex targets in which it participates as a sub-target. A target with limited applicability is the sub-target of only one, or a few targets of greater complexity. A target with broad applicability is a sub-target of many targets. Principle #1 – Potential. Humans are endowed with an inherent potential for increase in capacity, the establishment of habit, and the definition of being. This is the first principle of learning, upon which all others are predicated. That every person has capacity is a self-evident reality. As used here, capacity refers to one’s ability to do, to think, to believe, and to feel. Doing and thinking are both ways of acting. To act by doing is to interact with the external world. To act by thinking is to interact with the internal workings of one’s mind. Thus, capacity to act refers to the extent of one’s ability to interact with both the shared external and the private internal worlds. Similarly, capacity to believe is the extent of one’s ability to hope, to dream, or to have faith. Belief determines the self-prescribed bounding limits of one’s actions. Capacity to feel is the extent of one’s ability to connect with people, events, places, or things. Feeling determines both the depth and richness of one’s experiences. It is the primordial function of human life, to extend the capacity and establish the habits of the individual, whether by his or her own intention, the intention of another, or by happenstance. Figure 1 depicts this potential for increase, with the stick figure in the lower left representing one’s current state, and the stick figure in the upper right representing some potential state. Except in very rare and unusual circumstances, a person’s capacity to act, to believe, and to feel has potential for increase. 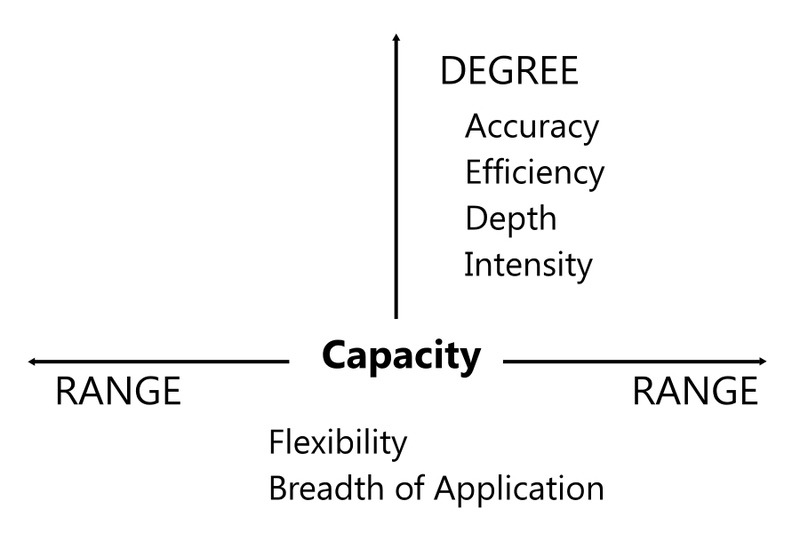 Capacity can increase both in range and degree (Figure 2). An increase in range is a horizontal expansion that provides for greater flexibility or broader application. An increase in degree is a vertical expansion that brings greater accuracy, efficiency, depth, or intensity. An increase in range enables a person to do more; to think about more; to believe in more; and to feel, or emotionally respond, to more. An increase in degree enables a person to do it better, to think more effectively or more profoundly, to believe with greater endurance, and to feel more deeply. Habits are automated patterns of doing, thinking, believing, and feeling. Just as capacity can be increased through the process of learning, so too can habits be established; and they can be changed. Not only does the human potential allow for increase in capacity and establishment of habit, but even the very being of a person can change. As used here, being refers one’s character, nature, and perpetual desire. Thus, learning is the process by which a stable and enduring increase in capacity, the establishment of habit, and the definition of one’s being, is produced.